ConceptDraw OFFICE is a suite of business productivity applications. It delivers software tools for mind mapping, professional diagramming and project management. This application suite is widely used for making business-related diagrams, for project planning and management. It can be used to create various dashboards, presentations, build technical schemes any other visual components of the particular business and technical tasks. ConceptDraw products are extended with a unique online service, ConceptDraw Solutions — an online set of professional solutions, intended to download and install product add-ons for ConceptDraw applications. This article will help you to download and install ConceptDraw products on your Mac. To download a ConceptDraw product, and switch on your trial or purchased licenses, you need to register on the ConceptDraw website. Please Sign Up on www.conceptdraw.com. Fill out the first stage of two-stage form with your information, and then click Sign Up. Check your email for the message from support@conceptdraw.com that contains your confirmation link. Add the conceptdraw.com domain to your Safe Senders List. This will allow you to receive emails regarding your ConceptDraw products. Follow the link to confirm your account and to fill out the second stage of registration. Since you have completed your registration, you are then able to download and install ConceptDraw products. Once the download is complete, doubleclick the .pkg file to install ConceptDraw OFFICE with the Apple Installer. Follow all the on-screen instructions to complete the installation. Click Close to end the installation. 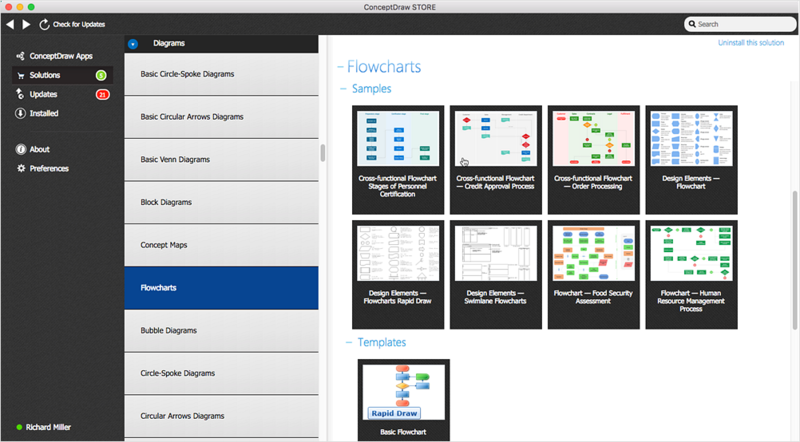 Once the installation is completed, ConceptDraw STORE runs automatically. Click Connect to account at the left-bottom of the STORE window. The Account tab will be opened. Enter here the email address and password associated with your ConceptDraw account and press Sign In. The trial and purchased licenses listed in your account will be delivered to your computer automatically through your internet connection. Installing and updating ConceptDraw products requires administrative permission due to Apple's security policy. ConceptDraw Solutions are installed to a user’s home directory and can usually be installed and updated without administrative privileges. Other ConceptDraw STORE functions such as being informed of our updates and activating products do not require any specific permission and can be performed with regular user rights.